Who’s a happy boy then. I have been teaching drawing for many years, at the School of Design at Curtin University in Western Australia, where I was a Senior Lecturer [1969/2001] and since retirement in 2000, through private tuition and as a drawing instructor. I also also hold Anatomy and Proportion workshops for various groups around Perth and also respond to many inquiries from all over Australia and overseas. You will see in the ‘being a model’ section of the site that I also promote models and coach if asked. I am in my mid seventies, so I have been hanging around the Perth Art scene for a long time. I spent my pre academic life as a television designer both in Australia and the UK, after my Art School education at Perth Tech in its ‘golden era’ of the late 50’s. I rarely exhibit, but recently I sold very well at the 2018 ‘Body Beautiful’ at Atwell Gallery. Mostly I consider my drawing to be a highly personalised inquiry. If they look good as well, for me it is a bi-product, but out of the thousands of drawing I must have done I have only framed a few. Recently I decided to show most of my ‘kept’ work online, so it is now on the vast archive in the gallery section of this website, hopefully to be updated in early 2019. My other activities inside of the art world is encouraging other Artists, coaching, and the occasional Judging and opening exhibitions. Guess this comes about from being in the scene for a long time! I am passionate about promoting life drawing and it give me much pleasure to see how well the Life drawing community in Perth has expanded and moved into the mainstream both as a discipline and also a pastime and even an ‘entertainment’. It also gets a big tick as a healthy workout for the brain and eye/hand co-ordination. In 2003 I co-founded and help coordinate a regular life drawing group, now based at The Bassendean Community Centre, Old York Rd, 70 metres from the Bassendean train station. Our group is called FAB, [Figure Art Bassendean] and it’s just that. 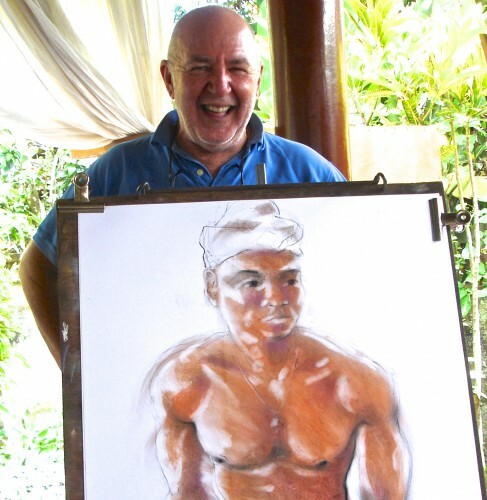 One of the most comprehensive drawing sessions around, usually with 3 models per session. Come and join us. Its a terrific venue, costs $20 per session. Bring your own materials and easel. For more info press the contact me button. I also take individuals and groups up to Bali for tuition [if they wish it] where we stay in the beautiful compound of Pondok Saraswati near Ubud and for 9 days use a beautiful village studio for up to 6 hours of drawing and painting per day. This is a great way to gain another level of accomplishment at drawing and have a great time as well. Next one starts in April/May 2019. More information on this site. My wife Georgia is also an accomplished artist and so is my son Michael and daughter Catherine. We have all had an Art School education. It goes back further! My father was a painter and my mother a poet, so my future was pretty much set. Michael is an independent designer living in Melbourne, and Georgia, besides being an artist is the recently retired CEO and an inspiration behind the Uthando Doll Project on behalf of the orphaned children in Zulu Natal South Africa. Daughter Catherine has a keen eye for the vintage in clothing, home wares and collectables.